Q: It is now four years since Beijing hosted the Olympic Games. What have been the biggest effects – economically and politically for the Chinese government in hosting the Games? Do you see London and the UK enjoying similar benefits? A: The Beijing Olympics was a milestone in China’s development. It was China’s long-held dream coming true to show its commitment to the Olympic spirit. It was a symbol of China’s maturity, openness and progress. It left a lasting legacy. China after the Beijing Olympic Games is more focused on peaceful development. As a result China is more open and committed to co-operation in its endeavour to achieve peaceful development. China is pledged to working with people of all countries to secure a harmonious world of enduring peace and common prosperity. I believe London Olympic Games will also have a positive impact on Britain in many fields. Apart from the visible legacy, such as improved infrastructure and impressive sports venues, it will play a huge role in boosting the British economy and sports industry. It will also promote to the world Britain’s diversified culture and increase mutual understanding between British people and those of all countries around the world. Q: Has the government been able to quantify these benefits? Do you have any statistics that help show the benefits? A: The 2008 Olympic Games has clearly played a huge role in promoting Beijing’s economic and social development. The seven years from 2001, when preparations started, to 2008 saw the longest and steadiest growth of Beijing’s economy. I can give you some examples. First, it stimulated fast economic growth. Between 2002 and 2007, Beijing’s annual growth rate averaged 12.4%. That was 1.9% higher than the figures between 1996 and 2001. In 2007, Beijing’s total economic size doubled compared to its 2001 level. Second, it greatly advanced a positive shift in Beijing’s growth model. The share of value-added generated by the service sector in its GDP rose from 67% in 2001 to 72% in 2007. Third, it created jobs, raised people’s income and improved people’s lives. From 2002 to 2007, the employed population in Beijing increased by more than 300,000 every year. There was basically no unemployment. In 2007, per capita disposable income of Beijing’s urban population reached 21,989 RMB (£2198.9). That was up by 89.9% on the 2001 level. Fourth, it speeded up Beijing’s urbanisation process. From 2002 to 2007, a total of 400 billion RMB (£40 billion) was invested in infrastructure development. There was an average annual growth rate of 18.3%. The sum was also 2.3 times the total investment between 1996 and 2001. The effect was remarkable, in particular in upgrading transport infrastructure. The impressive Terminal 3 of Beijing Capital International Airport is the best example. Q: Was the experience of the Beijing Olympics what you were expecting? What were the biggest surprises that the Beijing Olympics created? A: The biggest benefit of the Beijing Olympics was that it helped enlighten people around the world about the progress of Chinese society. It created a new landmark in China’s development process. The Beijing Olympics coincided with the anniversary of the thirty years of reform and opening up in China. Hosting the Games showcased China’s advances and rising self-confidence. It was viewed as China’s debut on the world stage and sent out a strong message on China’s commitment to reform and opening up. The 2008 Games placed China on the global stage. This focus in the global spotlight helped China cope with much greater attention from around the world in a calm and confident way as befits a major country. The 2008 Games also brought China’s engagement with the world to a higher level. It demonstrated China’s sincerity and strong sense of responsibility to the world. It also displayed the world’s confidence in China. Looking back, I can say that we had a catalogue of happy surprises during the Games: the spectacular ‘Bird Nest’ and ‘Water Cube’; the spectacular opening ceremony; the stunning performance of athletes and the quality and warmth of service from the volunteers. But for me, the happiest surprise is its legacy for China as a nation that I have already mentioned. I have no doubt the Beijing Olympic Games will go down in history as a milestone in China’s development. Q: What do you think were the biggest challenges that the Beijing Olympics had to confront? Are any of these challenges replicated at the London Olympics? A: This was the first time China had hosted the Olympic Games. So, we faced huge challenges in many aspects. Not long before the Games, a massive earthquake hit China’s Sichuan province and inflicted heavy casualties. In addition, the sub-prime mortgage crisis had already broken in the United States and dealt a heavy blow to global financial markets. Lehman Brothers was on the brink of collapse. The world economy was at a tipping point toward recession. While sparing no effort in earthquake rescue and relief and tackling the financial crisis, the Chinese government and people also made great efforts to prepare for the Games. We kept our word and presented a wonderful Games. In fact there were misgivings about China’s ability. But what happened proved such concerns unwarranted. The Beijing Olympic Games were not only a success, but also better than many had expected. A successful Olympic Games in London will meet the aspiration of not only the British people, but also people throughout the world. This is the third time Britain has played Olympic host. So, the UK is a much more experienced host than China. Of course, like any previous Games, pressure will be enormous in organising, security and logistics. But I trust London will create a new success in Olympic history. Q: What is your favourite memory of the Beijing Olympics? A: The people of different colours, language and ethnicity gathered in Beijing. We shared the joy of the Olympics. We joined hands in pursuing peace. This is where the beauty of the Beijing Olympic Games lies. It turned ‘One World, One Dream’ from a motto into reality. It is the perfect example of the Olympic spirit: solidarity, friendship, progress, harmony, participation and dream. Q: What do you think is the overall impression people within China think of Beijing now? A: Beijing is China’s national political and cultural centre. It is also one of the financial and commercial hubs in China. It is the largest base of scientific research and academic centre of China. In addition, Beijing has a history of more than three thousand years. It is a city with one of the largest concentrations of cultural heritage in the world. So, by any standard, Beijing holds an extremely important position in China. I believe every Chinese would use the word ‘great’ when they talk about Beijing. This greatness comes from two aspects. First, modernisation. In 2011, Beijing’s GDP topped 1.6 trillion RMB (£160 billion). Per capita GDP exceeded $12,000. It is estimated that in five years Beijing’s per capita GDP will reach about $20,000. That will be close to the level of medium developed countries. Second, internationalisation. 76 of the world’s top 500 companies have their headquarters in Beijing. Places like the ‘Financial Street’ and CBD are the hallmark of China’s openness and economic prowess. Beijing is now making tremendous efforts to draw talent and expertise from around the world. The aim is for Beijing to become a capital of international events, multinational companies and world class talents. Q: What do you think is the overall impression people outside of China think of Beijing now? A: There is a saying: “There are a thousand Hamlets in a thousand people’s eyes.” It would be more fitting to ask a foreigner this question. In my view, if anyone wants to know more about Beijing, he should go to see Beijing. Of course if he cannot go in person, there are many sources of information about Beijing in London. Not long ago the Beijing Culture Week was held in London, which included various events showcasing Beijing’s culture, arts and folk customs. Activities like this are the best chance for you to experience Beijing in London. Q: Do you think people will change their opinion of London after the London Olympics? If so, in what way? A: With the great efforts of the Organising Committee and wide support from countries around the world, the London Olympic Games will deliver a sports and cultural carnival. London is lucky to have both modern sports facilities and great historical buildings side by side. This combination means London can impress the world as a city of exceptional modern and historical heritage. The 2012 Games will offer an excellent stage for Britain to show its cultural heritage. The many innovative concepts applied in preparing for and running the Games will also build up London’s image as a creative city. Q: What are the biggest risk or challenges that London faces in hosting these Games? A: Hosting the Olympic Games is a huge logistical project. It involves immense tasks with transportation, security and planning. Ensuring a smooth and successful Olympic Games is a big challenge for every host. The London Games is no exception. The British government, London Olympic Organising Committee and all the other official bodies involved have made tremendous efforts. I wish the London Olympics a great success. Q: The Olympic Games creates an environment for political and business leaders around the world to converge. How will Chinese politicians use the London Olympics? A: The Olympic Games is not only an occasion for athletes to show their sporting skills. It is also a good opportunity for people around the world to strengthen mutual understanding and friendship. The Chinese government places high importance on the London Olympics and encourages Chinese athletes to create new records. Chinese State Councilor Dai Bingguo attended the Opening Ceremony of the London Olympics as representative of the Chinese government. China sent to London a large sports delegation of more than 600 people. During the Games, we have held Beijing Culture Week, the seminar on the development of Olympic cities and many other activities to spread Chinese culture and introduce the latest achievements of Beijing. The Chinese Olympic Committee and the Chinese embassy have for the first time set up a ‘China House’ during a Summer Olympic Games to show China’s progress in the Olympic movements and introduce China to the British public. We hope the London Olympics will lead to better mutual understanding between Chinese and British people and greater exchanges and co-operation between China and UK in urban development, sports and economy. 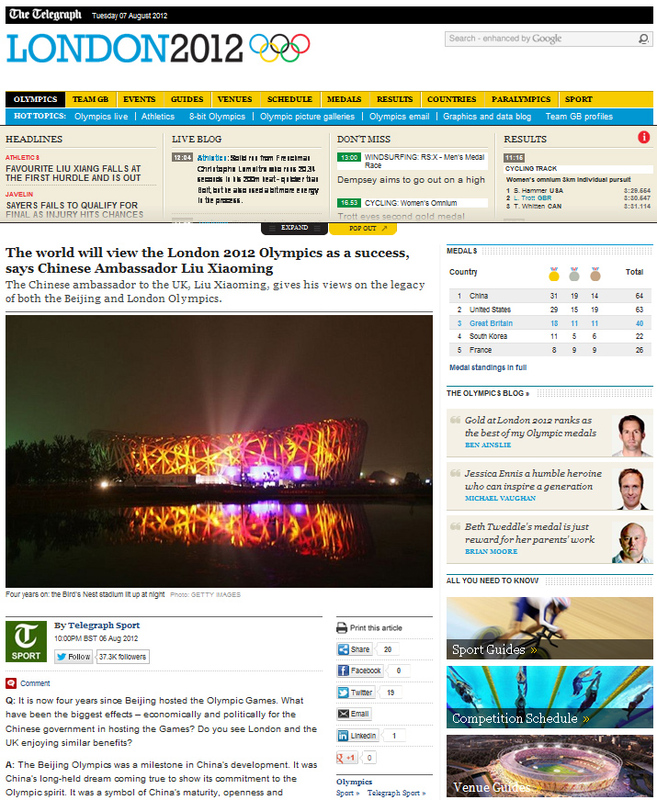 Q: How will Chinese businesses benefit from the London Olympics? A: It is fair to say that London Olympic Games has offered many opportunities and delivered real benefits for the Chinese business community. First, some Chinese companies have been granted franchises to market Olympic products or allowed to become a sponsor. Examples are many. The Beijing Huajiang Culture Development Co. Ltd won the franchise to sell 2012 Olympic pins. The Shanghai Haobo Chair Co. Ltd secured the order of seats for Olympic venues. The Beijing Crystal Computer Graphics Company became one of the sponsors and the official digital imaging services supplier of the London Games. While contributing to the success of the Games, these companies also reaped commercial profits. Second, many Chinese entrepreneurs see the London Olympic Games as a platform for business matching activities. In concurrence with the opening of the Games, the British government has initiated a China Business Day. It has drawn more than 100 private business leaders from China. More than 30 of them are members of the China Entrepreneur Club. These business leaders will visit many places in Britain and interact with their British counterparts. They will draw inspiration from such exchanges and explore more ways to strengthen co-operation with British businesses. Third, Chinese companies have taken this opportunity to go global by scaling up their investments in Britain and the whole Europe. It is the right time for Chinese companies to explore British and European markets. London is a global financial hub. It can be a springboard for Chinese companies to go to Europe. Britain holds out great investment opportunities in engineering, creative industry, life science and pharmaceutics. Statistics show that since January last year, Chinese companies have invested in UK about £3.5 billion through joint share holding or merger and acquisition. The growth has been truly impressive. Q: How can London learn from the Beijing Olympic experience? A: There is no uniform criteria for the success of Olympic Games. As long as the host presents interesting and creative ideas and athletes bring out their best in competitions, then the Games will be successful. One hundred years before Beijing became an Olympic host for the first time, London had already hosted the fourth Games. On top of that, London has twice hosted the Olympic Games. So London is already a veteran host city! I understand that each Games will face different problems and challenges. We would be glad to share with British friends our experience in the Beijing Games. I hope and I believe that with the concerted efforts of the British government and people, London will surely deliver a successful Olympic Games.